Following the devastation by Hurricane Sandy, Cape Liberty cruise port in Bayonne, New Jersey is open again for departures and arrivals. 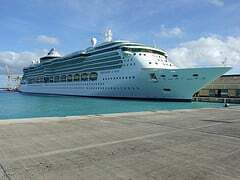 Royal Caribbean's Brilliance of the Seas is in port today for an eight night cruise to the Caribbean. Royal Caribbean spokesperson Cynthia Martinez said the Cape Liberty sustained some water damage as a result of Hurricane Sandy. Once the storm passed, the Cape Liberty staff began working to prepare the terminal for the arrival of passengers today. All of the port's power is being produced by backup generation because the electricity has not been restored to the terminal building. Royal Caribbean is dealing with refunds and rescheduling tickets for those who can't get to the port because of Hurricane Sandy on a case-by-case basis. People who can't make their scheduled departure are encouraged to call (866) 562-7625. There's a report out that claims Royal Caribbean is interested in sending its ships to the port city of Kotor in in southwestern Montenegro. This Mediterranean port city is an option for Royal Caribbean to send its ships there. According to the report, Royal Caribbean is considering significantly improving service to Kotor harbor. Royal Caribbean is partnering with Barbados Port and SMI Infrastructure Solutions to build a brand new state-of-the-art cruise terminal in Barbados that will cost over $300 million. The new facility will allow some of the world's biggest cruise ships to dock at the island. George Hutson, Barbados Minister of International Transport and International Business, announced the two year project at the recent Barbados Port Inc.’s 50th anniversary staff awards ceremony. “If we are going to remain relevant, if we are going to capitalize on the opportunities available from cruise tourism, we must renew our plant from the basic infrastructure currently existing to one which will accommodate and service the increasingly large cruise ships." The new terminal will be completed in two phases, the first phase will cost $300 million and will include two cruise piers, arrival and departure facilities, along with parking lots. The development will take involve reclaiming 15 acres of land from the sea, 100,000 square feet of which will be provided for commercial activity. Dredging is slated to begin in November. The Ukrainian government will begin promoting the development of a cruise industry in its country, specifically eyeing the ports of Odessa, Sevastopol and Yalta as prime candidates. Royal Caribbean vice president Craig Maylen met with Ukranian Minister of Infrastructure Borys Kolesnikov during a visit to the United States. Maylen talked about the future of the ports, "Odessa port has great prospects for receiving cruise ships, as it is in the heart of the city, and it is very convenient for tourists"
The meeting took place in Royal Caribbean's headquarters in Miami, Florida where the two sides discussed a number of issues regarding the potential of Ukrainian ports in the cruise industry. According to Maylen the port has quite a good infrastructure. With certain infrastructure improvements in Yalta and Sevastopol, the ports could be upgraded to handle considerably larger cruise ships than they serve now. The head of the Phuket, Thailand Marine Department Office is trying to kick-start stalled negotiations to expand the port to allow larger cruise ships to dock there. 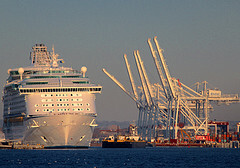 Represenatives from Royal Caribbean and Princess Cruises met with Thai officials on July 12 to discuss the problems encountered by large ships using their port. Located at Cape Panwa, the deep sea port has long been criticized as too small to accommodate large vessels, both cargo and passenger, for docking. According to Marine Department Region 5 chief Phuripat Theerakulpisuk, Royal Caribbean wants to see the government become more involved in lengthening the wharf and dredge the seabed. Chief Phuripat cited one example of a Royal Caribbean's Voyager of the Seas, measuring 312 meters long and 38m wide, that is forced to moor about four kilometers from the wharf and ferry its passengers ashore on smaller vessels. The port of Batumi in the Republic of Georgia will see 14 cruise ships visit it this year, with 8 confirmed and the other 6 in the negotiations. All the cruises will visit the brand new cruise terminal that Royal Caribbean has been designing. The Deputy Head of the Department of Tourism and Resorts of Adjara A.R, Sophio Lazishvili, commented on the work, "“In September 2012 the cruise company Royal Caribbean will complete the design works for the new port. 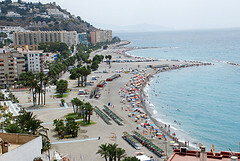 Actual construction will begin in October 2012." The new cruise terminal has hopes it will draw more cruise ships to the port. Representatives of travel agencies say they do not offer cruises to Georgians because of the sheer lack of demand. Royal Caribbean struck a deal with the port of Batumi back in June of 2011 to help develop the port for cruise ship traffic. Royal Caribbean representatives along with representatives from Norwegian Cruise Line met with port officials from Almuñécar, Spain as a possibility for shore excursions on future cruises. The port cities of Motril and Malaga, Spain were also on hand as these cities were looking for ways to bring back Royal Caribbean after they announced the company would cease port calls to Malaga next year. This visit is part of the campaign to promote the Port of Motril as a destination for cruise ships where other cruise lines are already operating with some regularity. The visit began with a welcome by the Municipal Tourism Coordinator, Rafael Caballero, at the headquarters of the Tourist Board of Almuñecar. In addition to delivering information about the town municipality, Caballero informed the group of the availability of a guided service to show some of the most prominent monuments and archaeological sites. For municipal representative, Rafael Caballero, the visit of two large cruise line representatives "is very important to Almuñécar so can be assumed in the projection of our community be included in brochures and possible destination of tourists arriving to the port as we have had the opportunity to meet, "he said. Royal Caribbean passengers can for at least this winter, enjoy a cruise to Guadeloupe aboard the Brilliance of the Seas. 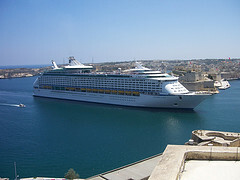 The ship will offer departures from November 14, 2012 to April 3, 2013. The ship will carry passengers every Wednesday to Pointe-à-Pitre for cruises of one week with two alternate routes: Guadeloupe, Saint Lucia, sea day, San Juan, Tortola, St. Martin, St. Kitts and return to Guadeloupe; Guadeloupe, Barbados, sea day, San Juan, St. Thomas, St. Croix, St. John's and back to Guadeloupe. Royal Caribbean will send Voyager of the Seas to dock in Keelung, Taiwan as part of its Asian itinerary in late August. Lin Kai-ti, chairman of Royal Caribbean's Taiwan branch confined that Voyager of the Seas will bring its 3,800 passengers to the port later this year. Voyager of the Seas has already been to Singapore in May and will make stop in Keelung across three cruises going from August through September. In addition to Keelung, the liner will take travelers to China's Shanghai and Tianjin, Japan's Fukuoka, and Jeju Island in South Korea.